What’s in a name? Enter the Name the Lumiere Whale Contest! 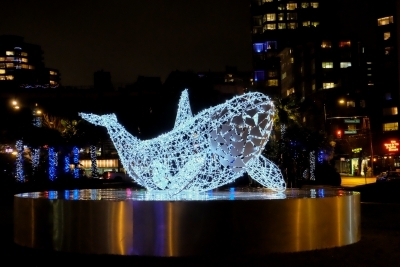 If you’ve been by Morton Park in the past week, you’ll be familiar with MK Illumination‘s Orca Whale. The first of several lighting installations to be installed in the West End as part of the 2015 Lumière Festival, the social media world has exploded this past week with all kinds of great images of this new seasonal lighting feature in the neighbourhood. You can learn more about the Orca Whale here. Which got us thinking… This Orca Whale needs a name! So we created the Name The #LumiereWhale Contest! What do you think our Orca should be called? Whale-ma? Oliver Orca? Wilbur the Whale? 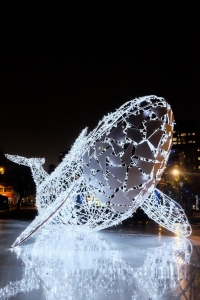 Send us your ideas on Facebook, Twitter and Instagram using the hashtag #LumiereWhale and on December 15 our panel of judges will select a winner. The winner will receive a $150 gift certificate to the Beach Bay Cafe and Patio, the perfect spot for a little winter whale watching. We look forward to your suggestions! For more info about the 2015 Lumière Festival, click here.